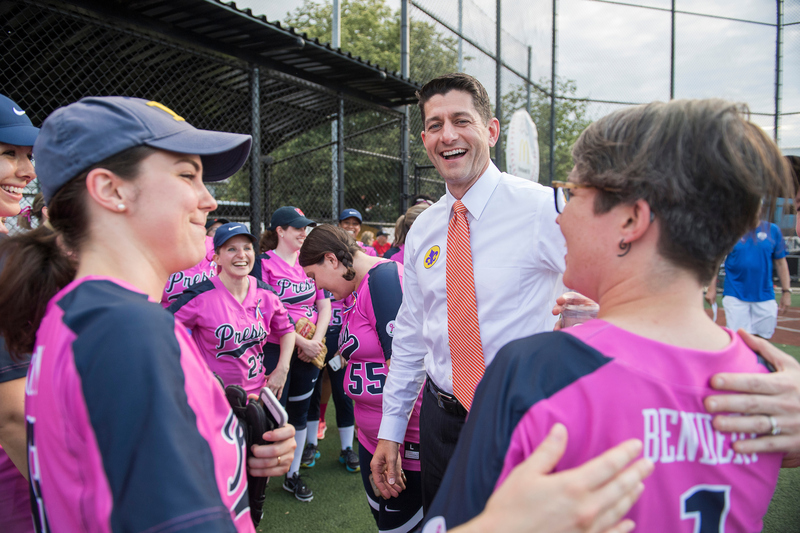 Between the large crowds, record-breaking fundraising, a heroic first pitch, bipartisanship throughout the stadium and the game itself, it was hard to pinpoint just one takeaway at Wednesday’s Congressional Women’s Softball Game. The press team, known as the Bad News Babes, won the ninth annual game, 2-1, against the members of Congress. New York Democrat Sen. Kirsten Gillibrand scored the one run for the members. There were a several minor injuries, including one that had Rep. Michelle Lujan Grisham, D-N.M., walking out of the game on crutches. In the second inning, she fell running the bases and two men carried her off the field. Earlier, within minutes of the start of the game, New York Times’ Mikayla Bouchard, a press team co-captain, twisted her right knee while running the bases but was able to stand up quickly and walk off the field. In the top of the fourth, the score was 2-0 with the Bad News Babes ahead. “With our three grandmothers ... we will come back,” said Sen. Amy Klobuchar, one of the night’s announcers, referring to Sen. Shelley Moore Capito and Reps. Cheri Bustos and Ileana Ros-Lehtinen — all grandmothers. Gillibrand then got her run and apparently apologized for stepping on the press team’s catchers foot, the announcers said. Support for the annual event poured in following the shooting one week ago at the Republican team’s practice for the Congressional Baseball Game, which held its contest on Thursday, June 15. This week’s softball event raised $260,000 for the Young Survivor Coalition and sold over 2,000 tickets. Each player on both teams played for someone with cancer. Democratic Sen. Mazie Hirono of Hawaii was in attendance and told HOH that Republican Sen. Shelley Moore Capito was playing for her. Hirono announced in May that she was battling kidney cancer. Capitol Police agent Crystal Griner, one of last week’s shooting victims, left the hospital for 45 minutes to throw out the first pitch for Wednesday’s contest. She threw from her wheelchair to California Rep. Norma Torres, who then rolled it back to her. Griner then threw another pitch. Griner is a member of Majority Whip Steve Scalise’s security detail, who is still in the hospital and was upgraded today to good from serious condition. While Griner threw out the first pitch, Speaker Paul D. Ryan and his wife, Janna, stood on the baseline watching her. Rep. Patrick McHenry, who is filling in for Scalise as majority whip, was also in attendance as well as dozens of other members and senators. In addition to Klobuchar, the other announcers for the night were CNN’s Dana Bash and NBC’s Andrea Mitchell. The only game this close in score was in 2015.